MEDIAWAN RIGHTS - WHO'S DRIVING THE CAR ? International title : WHO'S DRIVING THE CAR ? Original title : QUI CONDUIT LA VOITURE ? Driving is already outdated ! 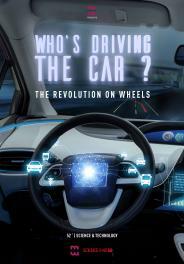 Far more than a simple technological innovation, the autonomous car is a true Trojan horse. Just as Uber turned the world of taxis upside down, it should also disrupt the world of cars, transports and urban space. With autonomous cars, a new hierarchy of transport players is coming and is going to change our world.